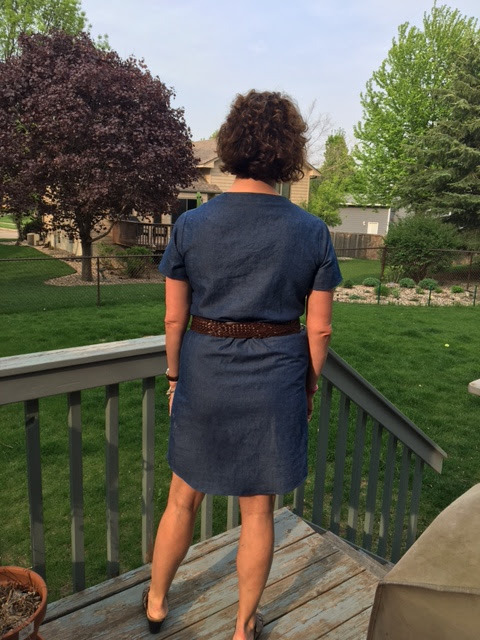 I love Chambray, it is super comfortable, sews together so well and looks great in so many ways! I decided to make my May contribution based on a cute little McCall's pattern, 7391 in a dress. I LOVE this fabric. It is soft, holds its shape, presses beautifully, and the color!!! My oh my, this is my ideal shade of Chambray blue. I like adding little bits of hardware at times and since this pattern had grommets, I had to try it out. 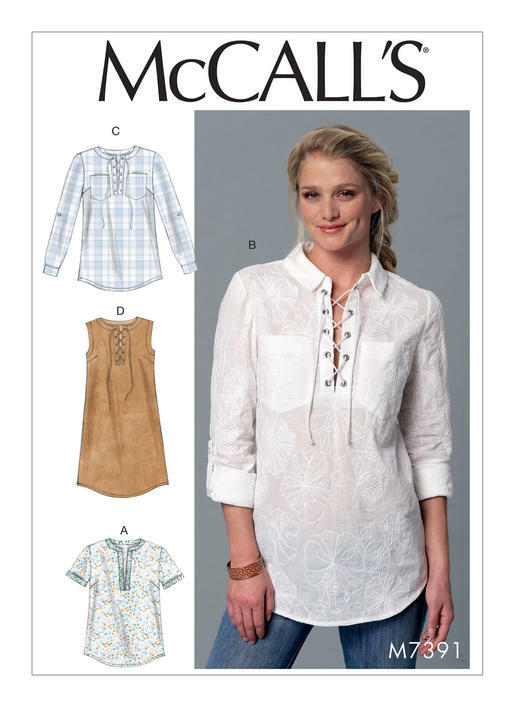 McCall's patterns are the ones I sew the most often and I know what steps I need to take to make the garment fit me. When you prepare your pattern tissue according to your fit, it makes construction very easy. I made an FBA, swayback adjustment, sloping shoulder adjustment and that's it. Although when you make a sloping shoulder adjustment you also must decrease the height of the sleeve cap and lower the armscye so the sleeve isn't too tight at the shoulder. 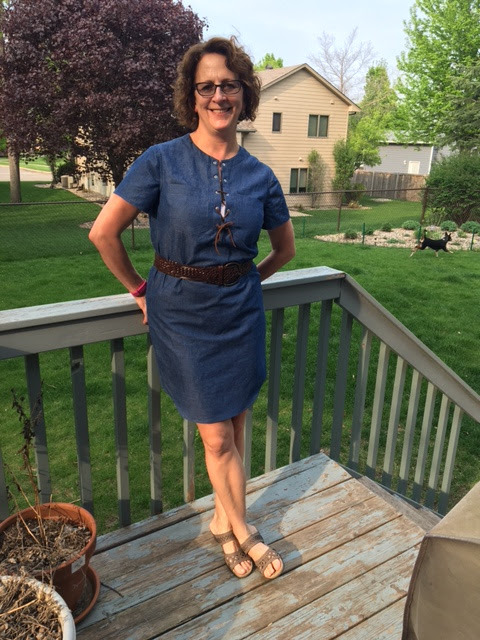 My serger was being serviced when I made this little dress and I wanted a very nice finish on the insider as well as the outside so I decided to make flat-felled seams throughout. 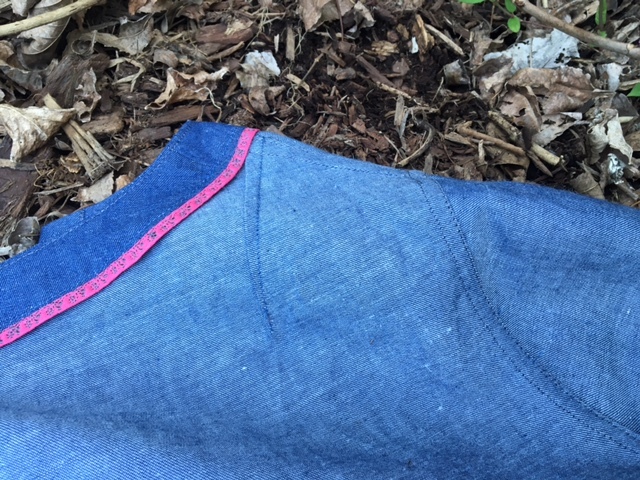 If you've never made flat-felled seams, don't fear! They are easy and quite fun and give you such a RTW finish on your garment inside. To make a flat-felled seam, sew your seams allowances with the typical 5/8". Press the seam open flat. Decide which direction you want your topstitching to show on the garment right side and cut the appropriate seam to a scant 1/4". I like to use applique scissors for this step. Next, press the untrimmed seam allowance under by 1/4" towards the seam you just trimmed. Lastly, stitch close to the fold line. 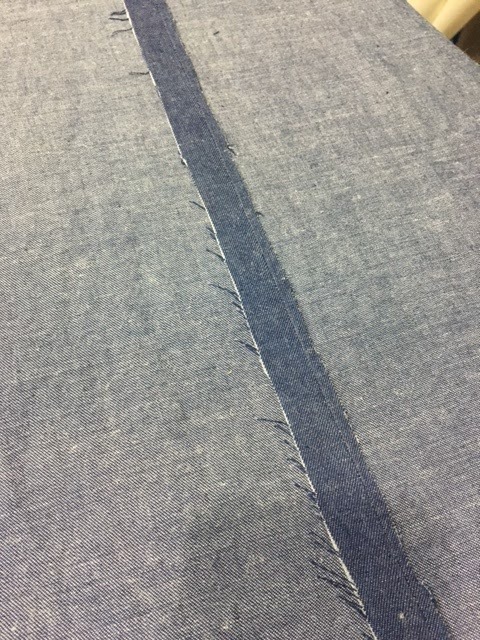 If you've sewn accurately, pressed and trimmed accurately, you will have a seam that is very precise and looks very good on the garment right side. When I stitch down the felled part of the seam, I use my edge stitching foot, move my needle over three notches, and increase the tension on my machine. I love the results I get. 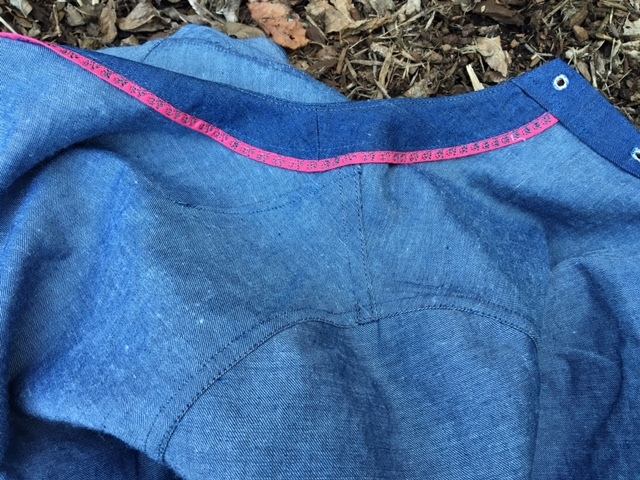 Below you can see the flat-felled stitching from the inside of the garment. It is also fun to add an element of surprise to a garment whether it is inside or out. Since my serger was out of commission, I added this bright pink bias tape to the lower part of the facing and used a decorative stitch to attach it. I really the pop of color when it is hanging up. This was a great, beautiful, and fun fabric to sew with. 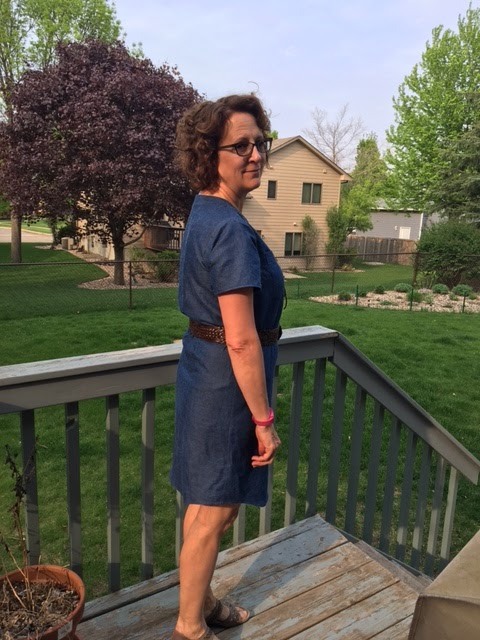 Choose a pattern you love, get a great fit, accessorize, or keep it simple and sew yourself a great dress with some chambray! 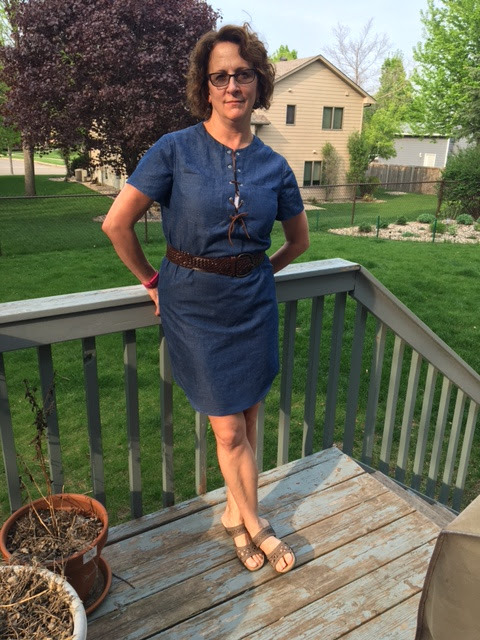 Love your chambray dress. 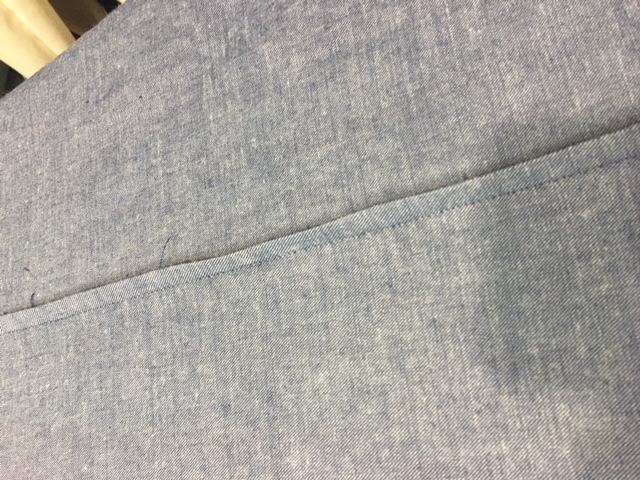 Where can I find chambray on Fabric Mart's site? I tried their search which returned something totally unrelated. I have a miserable time navigating their site. Usually give up and buy somewhere else. As of right now we do not have any chambray in stock. It's a hot seller and our buyer is on the look out for more. Sorry you have trouble with our website navigation. Did you know you can use the filters on the left side of the page to narrow your search? So if you add a keyword to the search box and you get many different options, you can use the filters to narrow your search. Or choose from the categories on the top toolbar and then use the filters on the left to narrow that search. I hope this helps. Perfect spring and summer dress! Love your pattern choice, great for this lovely chambray fabric. Your finishing techniques are impressive, and the fit could not be better! Thank you Annette! I appreciate you taking the time to comment and such a nice compliment! Happy sewing! Sue your work is always impeccable! I love this dress and your hue of chambray is perfect for it. I love how you pay attention to details. I have this pattern on my summer to-do list and you've given me a reason to push it further to the front of the line! Michelle, thank you for your kind words! I really do appreciate it! Happy, happy sewing!